Brothers Oliver and Richard Gladwin have lovingly created The Shed Restaurant in Notting Hill, taking over from where the Ark Italian Restaurant once stood on Palace Garden Terrace. Paying homage to their lifestyle in rural Sussex, the ingredients are sourced from their youngest farmer brother in Nutbourne and other local suppliers in Sussex. Otherwise it is foraged for, and the British menu is ever changing depending on what is available. It is classified according to ’mouthfuls’, ‘fast cooking’ and ‘slow cooking’, etc, and designed for sharing with smallish-sized plates. As it is a ‘shed’ with a back garden/farm yard feel to it, the restaurant is charmingly decked out with wooden benches, countrified tables, and colourful barrels. It’s a carefully designed hodge-podge furniture collection with a playful feel to it. But the problem is that The Shed is pretty cramped making it a little uncomfortable. And being so small with lots of people being squeezed into it and no floor padding made for some pretty noisy acoustics too. 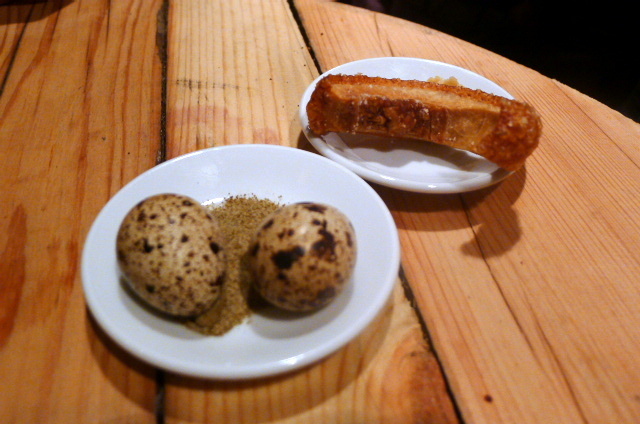 From the mouthfuls (small bites) section, quail’s eggs with celery salt (£1.50) would have worked better if they were slightly runnier. The celery salt was very good and worked a treat with the eggs. There was a good balance between the salt and the celery flavour. Pork crackling (£1.50) with apple sauce was tasty. A venison terrine (£6) with piccalilli was superb. It was meaty and well seasoned, and the acidity in the piccalilli showed off expert judgment. 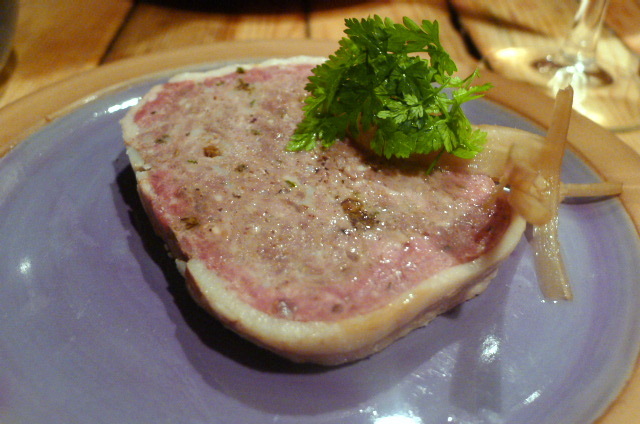 It both lightened and accentuated the taste of the terrine. This was some intensely flavoursome and careful cooking. The roasted vegetables in a winter root vegetable salad (£7) containing parsnip, turnip and swede were tasty but slightly underdone. However, the accompanying dukkah sauce made with cumin, coriander and a variety of ground nuts more than made up for it with its fabulous creaminess and tastiness. It was a great match for the vegetables. 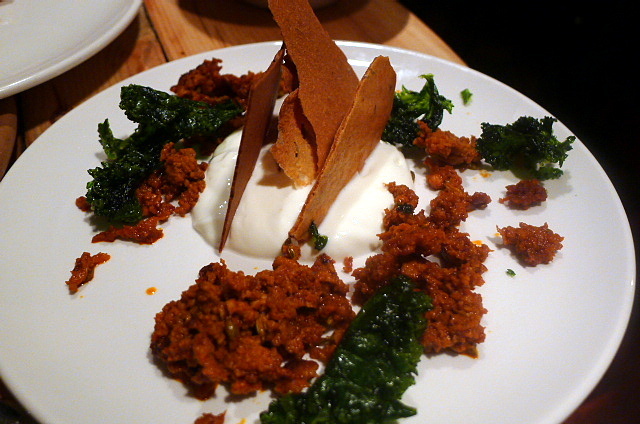 A creamy and delicate labneh cheese (£7) served with a fabulous crispbread went really well with a spicy and tangy minced chorizo meat. Some delicious crispy kale came as a garnish. This was also a fabulous dish. 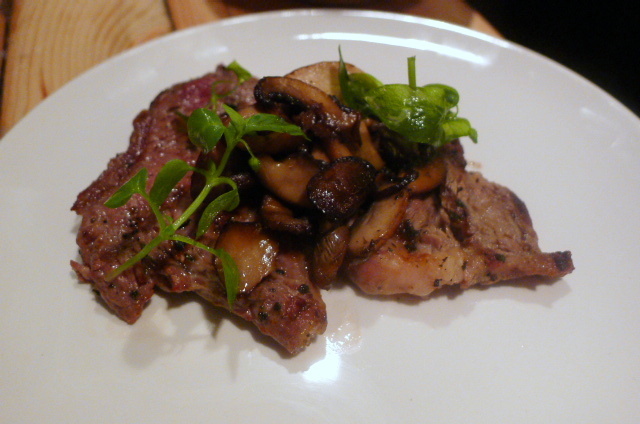 Less successful was the veal rib-eye steak with chestnuts, mushrooms and chickweed (£9) for it was slightly chewy, unevenly cooked and underdone. The execution of this dish was poor, and its chewiness meant the quality of the meat was slightly questionable. 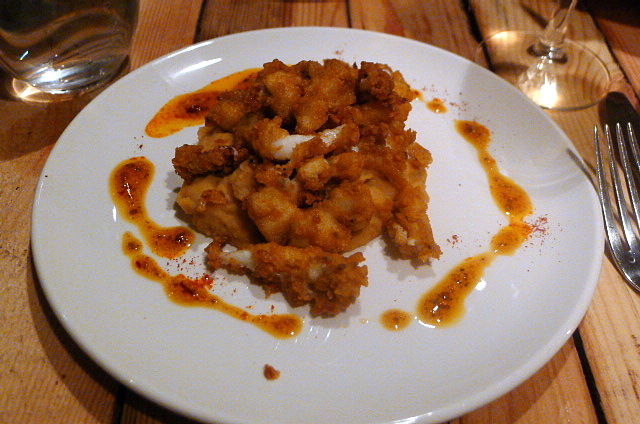 The portion of cuttlefish in a dish served with almonds and a sweet chilli white bean puree (£8) was stingy. There was little cuttlefish for £8, and the batter was too thick. But the puree was excellent, particularly with the sweet chilli running through it. It wasn’t a bad dish, just stingy. 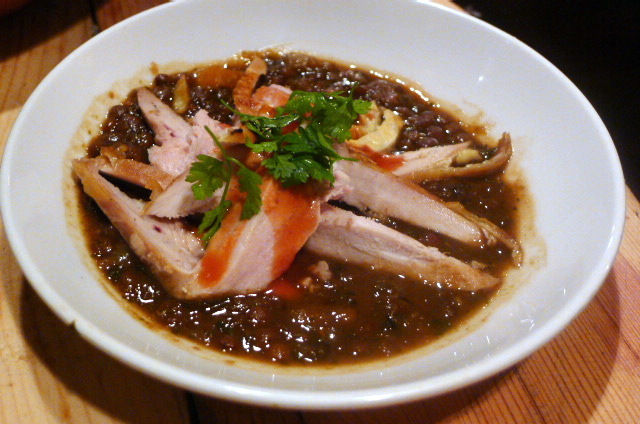 A pheasant dish (£9) disappointed as the meat was a little cold and slightly dry. It came on a bed of swede, lentils and rosehip that was pleasant enough, but there wasn’t quite enough stock flavour coming through the lentils. 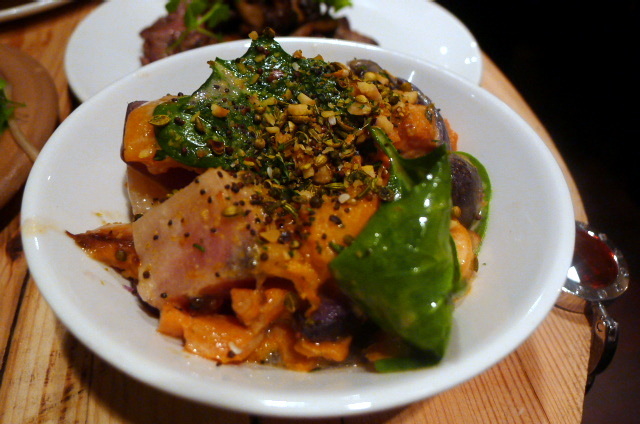 The taste of rosehip wasn’t discernible and this dish felt like poor value for money. 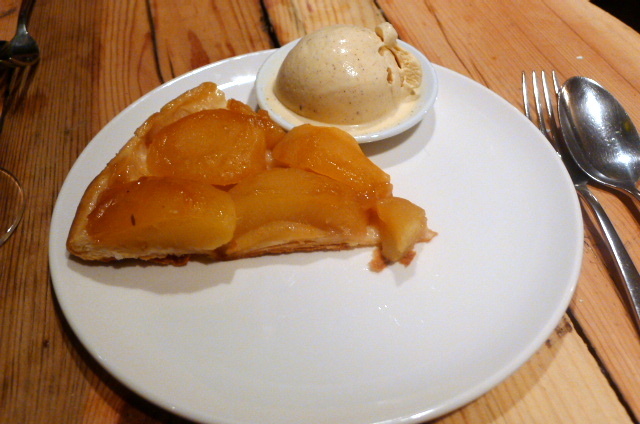 Pear tart tatin with cinnamon ice cream (£6) didn’t bear the hallmark of a true tart tatin. Pre-cooked and served cold, the pastry wasn’t flakey and there wasn’t enough caramelisation on the pears. The ice cream was very nice though. All in all it was a good pear tart, just not quite a tart tatin. There were many great elements to be had in this menu, but then there were also a few aspects that disappointed. But it was overwhelmingly good, and furthermore it was hard to ignore the originality of The Shed’s approach to provenance and its focuses on the use of ingredients in season and on hand. And impressively, the menu changes not only once, but twice a day, something that is pretty admirable. It was good sound cooking with a bit of flair. The food at The Shed may be enjoyable, but its greatest letdown is it’s sardine-like feel. It is super cramped which meant I was constantly getting hit by passing traffic and waiters. The bar stool on which I was perched was really uncomfortable as well. The noise levels didn’t make for great relaxation either, and a waiter was occasionally hard to come by. The food may be good, but the entire experience of eating at The Shed made for some hard work. Prices: £25 to £35 a head for 5 dishes and a dessert to share between two (but you could easily order more). Excludes drinks and service.